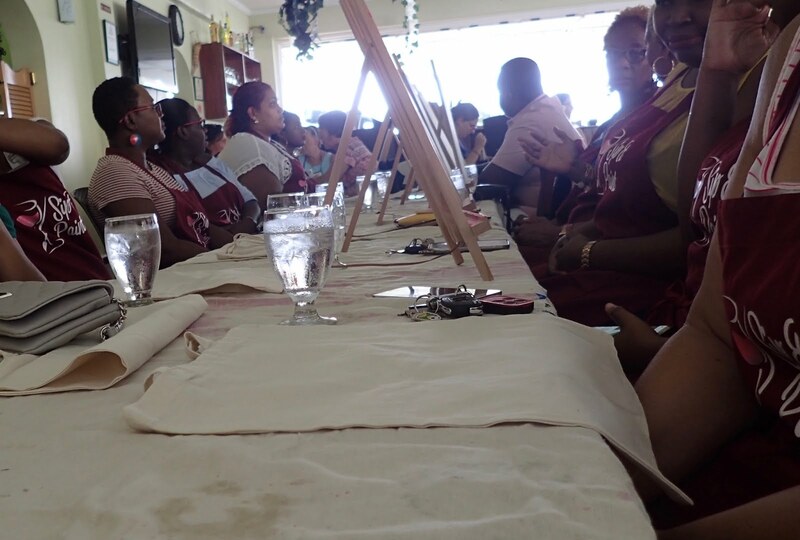 If you can tell how civilized a place is by whether or not they have a Sip-N-Paint... then Grenada is movin' on up! I've heard of these parties in the 'States. My daughter and her husband have done it and I've always been intrigued. But living on a boat, space is limited for things like paintings and such. When the Facebook page posted the Flamingo Tote event (if you only knew how much I love flamingos...) I wanted to go but talked myself out of it. A conversation with a friend, also on the fence about going, tipped us both! We made plans! I could hardly wait for the day to arrive. This is so much different from the things we normally do as cruisers and I looked forward to some giggly girl-time! And yes! There were men there as well! No way I could induce Bruce to do this. Just forget it. So, Maureen and I met up with several other friends we've met from around the island, and had a lovely and quite civilized time setting our inner artist FREE! My initial circles. You can see the many different tries... no matter. All of that will be painted over! My expectations were low, let's just get that right out there. 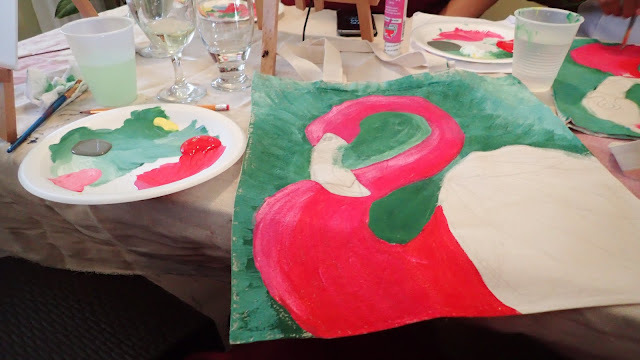 I have no talent for painting whatsoever and I wasn't even sure that I could produce something that I would even show in public... but I was up for the challenge. I was somewhat relieved when I learned that there were actual instructions on how to create this picture that were vague but easy enough to follow. First, they passed around a paper that had three circles drawn on it. 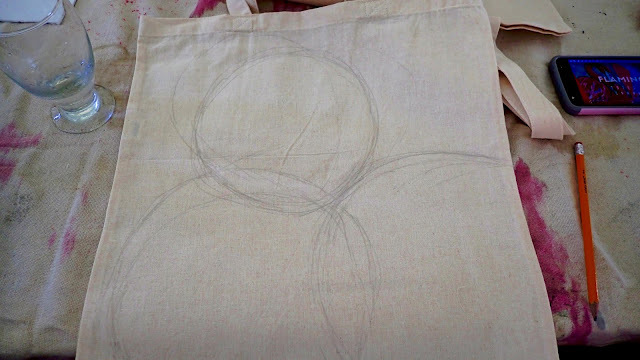 We were to simply draw these circles on our medium, be it tote or canvas. Then wait for further instruction. Simple enough - but I had to make it more difficult. I wear my bags on my left shoulder. If I painted this flamingo as instructed, it would be facing backward. I would have to flip it so it would face forward when worn on the left shoulder. I know. It's a sickness. Not only would I be painting something like this for the first time, but I would paint it backward! Of course our creativity was aided by these nice young men offering wine whenever our glass got empty! Yes please! 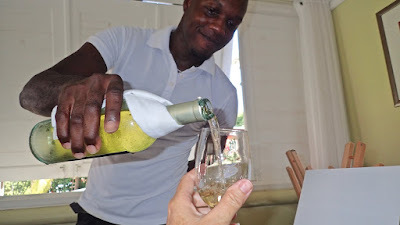 We got to try out several different varieties, all lovely and cold on a warm Caribbean evening. Things were moving pretty slowly but we were all having a grand time laughing and cutting up. It was fun being able to see how everyone did their own thing. We were all making the same picture, but everyone had their own way of doing things that made it really interesting. The next step was to make these strange loops. They came around with the page with the circles again and showed us how to add these additional shapes. In my mind I had to find markers on the circles then reverse them to be able to make them in the same position on my backwards piece. I had to work at it a bit, maybe the wine helped, maybe not! The cool thing was to go from looking at the shapes abstractly, to making them look like a flamingo in my mind's eye. Then I could make some minor adjustments that made it look more "right" in my mind. Very awesome stuff happening in my brain right now! 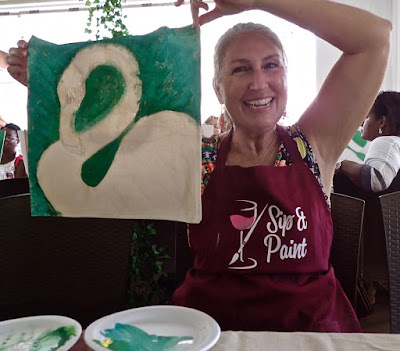 From circles and shapes to a flamingo! All it needed was a beak! Next, we were all given some paint to work with. We were instructed to mix the colors to make the background whatever color we wished! That's where things got crazy! Everyone had their own version going and seeing all the different combinations was the neatest thing! 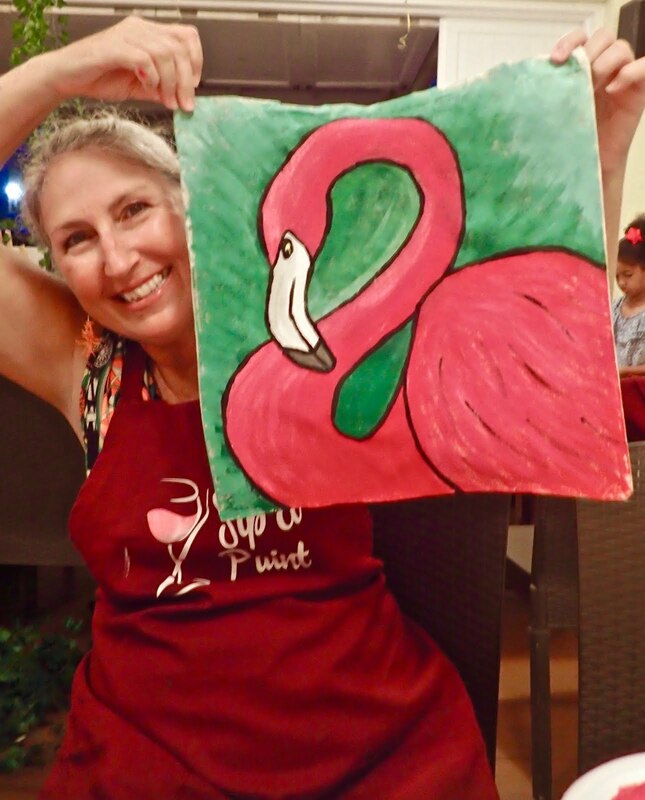 We had to overlap the edges of the flamingo a bit, then let it dry before continuing with the PINK! 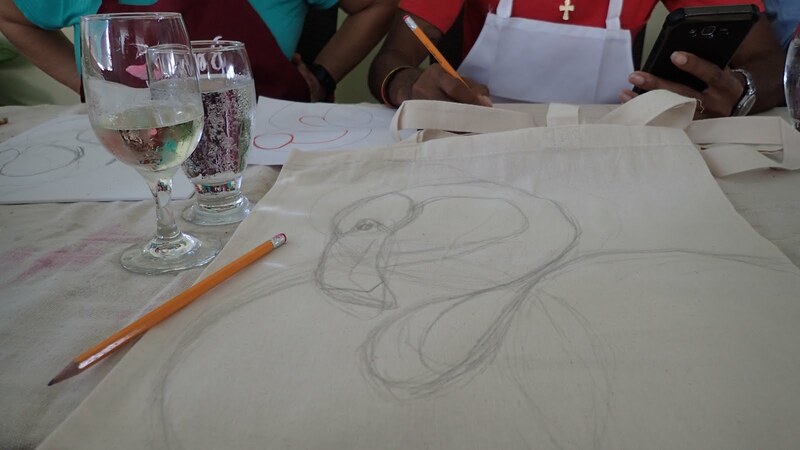 Some did canvas, others did totes! We all kept dabbing and dotting and mixing and brushing until at some point, we felt we were done with putting on the finishing touches. This one on the right is my favorite. 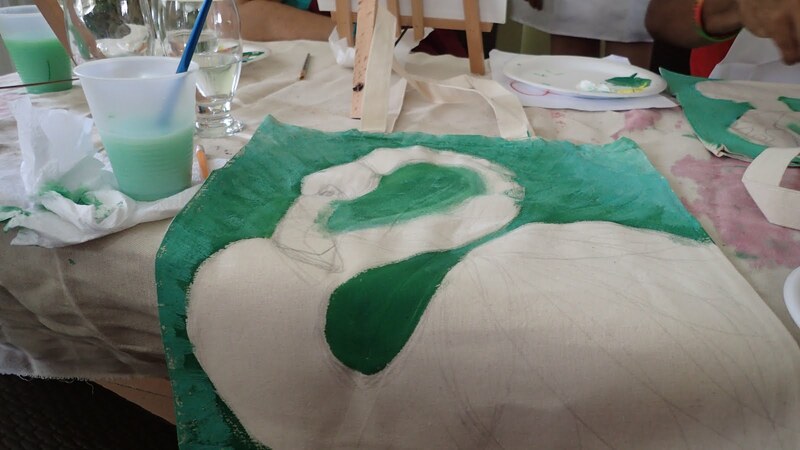 The wet paint had to dry before we could start on the Flamingo or it would all run together. This was the perfect time for a little mixer and some nibbles! A quick stop to get a refill and off to the buffet! Pockets in our aprons hold the wine glass handily! 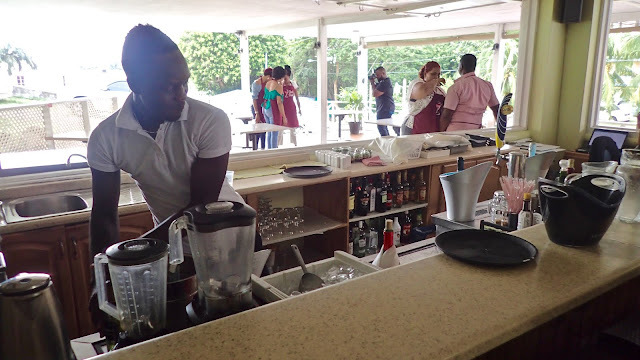 The kind folks at Le Chateau Restaurant and Bar were our hosts for this event. The venue was beautiful and the wine plentiful. 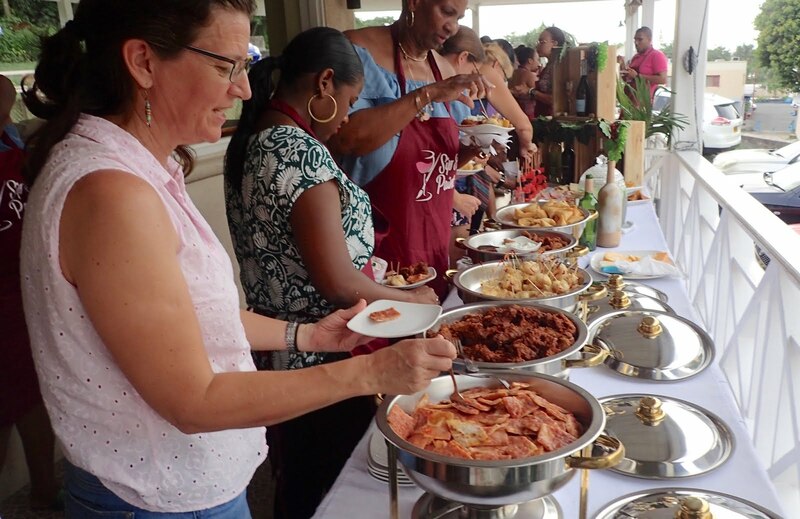 When we were invited to line up for a heavy hors d'oeuvres, they didn't have to tell us twice! Everything was delicious! 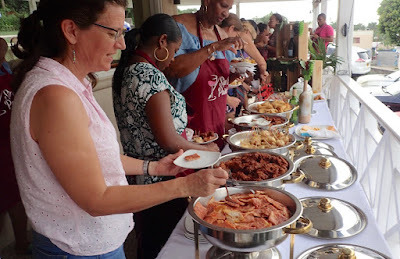 There was shrimp, pizza, fish fingers, won tons, cold cuts and crackers and beautiful fruits. Wow! Guess we won't be having dinner out after all! 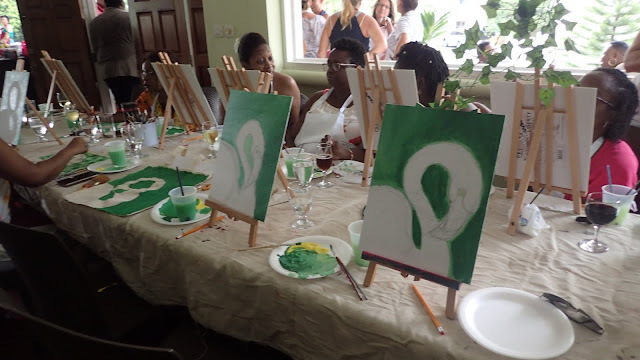 With six o'clock rapidly approaching, we were finally called back to our tables to commence painting the Flamingos! Pink, red, white, grey and black paints were doled out and we took one more look at the instructions. They told us to use the red on the lower parts then mix it with pink and white as we got to the top sides so that it would look like light and shadow. OK, if you say so! OK, it kind of looks like light and shadow. More paint please! Somehow, suddenly we were done! It was beginning to get dark and six o'clock had come and gone. The guys were waiting on the porch for us to finish so that we could go out for dinner. We took our wet masterpieces and posed for photos at the door, then said our fond farewells. The evening had been a delight! Who knew this was in me??? Now I've got a new tote bag to wear out and about, and whenever I see one like it, I'll know that I share a unique experience and some fond memories with that person. Everyone did so well. There were many different and unique styles, but each one of them "worked". I guess there IS a little bit of the Artist in all of us! 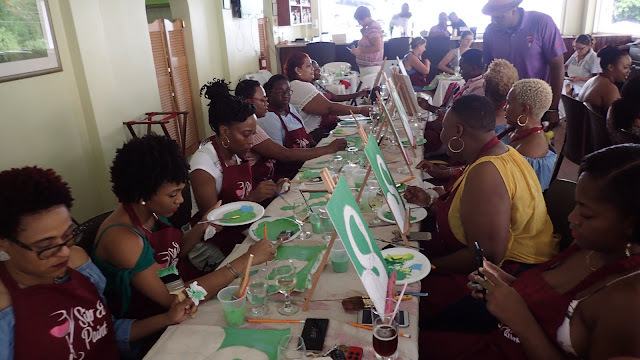 Thanks to Grenada Sip-N-Paint for coaxing it out! Well I think that you all did a marvellous job, from the venue, to the wine choices, to the food and of course the artistic guidance! 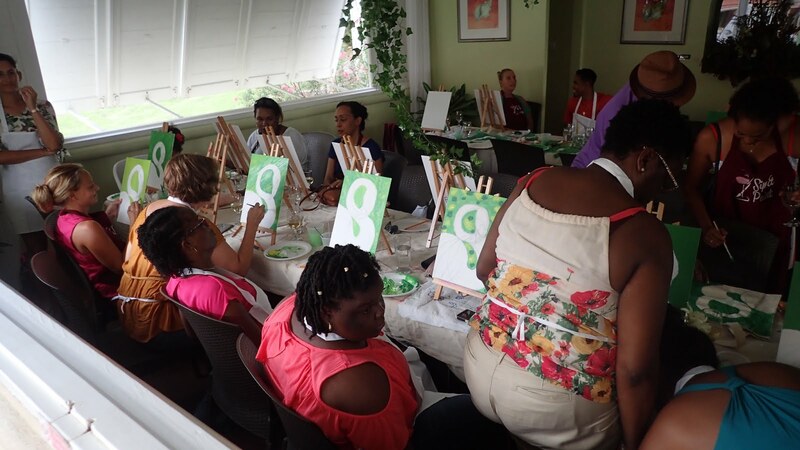 Good luck and may you continue to grow and provide people with a personal art experience!